A first had account from a participant in 1982 Warchest tour during Walter Mondale’s appearance at the Democratic National convention taking place at the Moscone Center. The Warchest Tours were a nonviolent protest movement directed towards corporations who funded the Democratic Party while also being involved in nuclear weapons research and military interventions around the world. With a month long campaign to clean up the streets aimed towards homeless people, punks, street performers and any other groups deemed not appropriate for a national focus during the convention, tensions were high downtown. David Solnit tells his story as a member of the Warchest Tour during the convention and what he and his colleagues faced because of their involvement. The form of a Warchest tour was taken from the "Hall of Shame" tours which were mobile protest tours that stopped at the corporations behind the nuclear industry in the spring of '82. They were organized by anarchists in the anti-nuclear power/weapons movement. 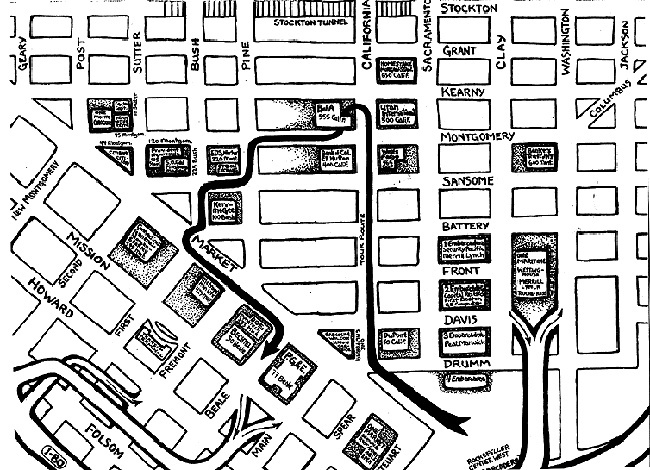 The Democrats had chosen San Francisco for their every-four-year National Convention in 1984. 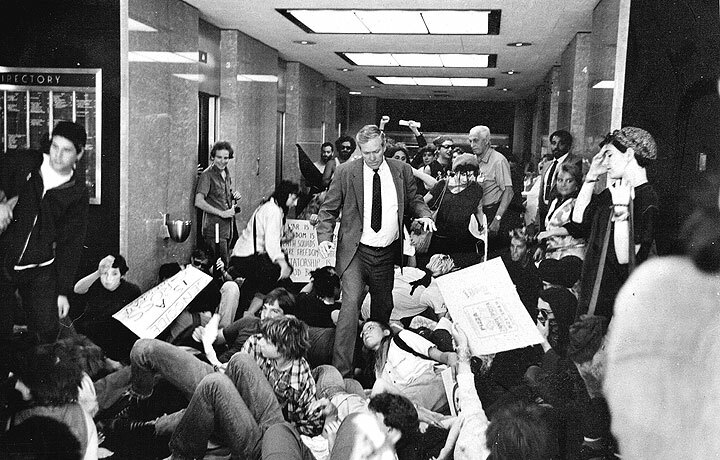 Walter Mondale was being nominated as Democratic Party presidential candidate a few blocks away at Moscone Convention Center, while hundreds of us were being arrested, dragged onto buses headed for jail and beaten in front of the Hall of Justice. A couple thousand of us had marched on the Hall of Justice after the police surrounded a Financial District street, arresting nearly a hundred people who were participating in the Democratic Warchest Tours. I was twenty years old, part of the collective that planned the Warchest Tours, and active in both the punk scene and the anti-nuclear direct-action movement. The Warchest Tours were a roving guerrilla-theater nonviolent direct action that confronted the corporations that fund and control the Democratic Party and are involved in nuclear weapons and military intervention. The Warchest Tours attempted to tear off the democratic mask of U.S. elections and confront the destructive corporate power behind both political parties. While most of the left opposition in the Bay Area were either supporting the Democrats or keeping silent, 455 of us were arrested and many beaten by the San Francisco police under Mayor (now Senator) Dianne Feinstein. Mayor Feinstein and the S.F. Police waged a campaign of repression to clean up and assert control over the city for the Convention: attacking demonstrations; harassing homeless people, prostitutes, punks and people who live in their vehicles; attempting to close gay bathhouses; requiring permits for street musicians; and licensing many cabs in opposition to the Taxi Drivers Alliance. A month before the convention an ad-hoc coalition of prostitutes, homeless people, cab drivers, street musicians and activists were clubbed off the steps of City Hall after a protest and press conference against the clampdown and clean-up. 18,000 politicians, delegates, and corporate leaders, thousands of cops, security forces, agents and spies, and 14,000 media personnel descended on San Francisco for the Convention. Documents obtained by the ACLU years later showed that police undercover agents had attended planning meetings for demonstrations during the Convention. Much of the Bay Area left/progressive scene spent the Spring figuring out how to relate to the Convention. Among the result were events implicitly endorsing the Democrats: supporting Jesse Jackson's bid for Democratic presidential candidate or CISPES (Committee in Solidarity with the People of El Salvador) and the Nuclear Weapons Freeze's "Vote Peace '84" Rally. Radical elements of the anti-nuclear movement, activist punks, a leftist cab driver, and people from the dormant anarchist scene formed a collective to plan actions during the Democratic Convention that would confront the destructive corporate power behind the Democrats' (and Republicans') mask of democracy. We produced an eight page handbook that included detailed research on the wretched pro-corporate, militarist records of the Democratic presidential hopefulls, including Jesse Jackson. It also detailed how the corporations "pull the strings" of the Democrats through contributions and closely interlocking leadership. There was also a small squatter punk/anarchist scene that had taken over a vacant warehouse-- the old Hotel Owners Laundry Company Warehouse (HOLC) at 935 Folsom-- and had thirty people living in it. The Warchest Tours created a vehicle for hundreds of young punks to collectively take their politics out of underground shows and into public space. The Warchest Tours were also a living critique of the left's forms of protest: monitors controlling and moving people like cattle, tactical leaders with bullhorns repeating monotonous chants, and even anti-nuclear sit-down-and-wait -for-the police-to-arrest-you civil disobedience that felt too much on the terms of the police. The Warchest Tours Collective encouraged avoiding arrest, nonviolent direct action, guerrilla theater, creative protest and fun. We advertised "NO MONITORS," refused to ask or negotiate permission from the police, and chose not to pursue corporate media coverage. We planned three "Warchest Tours" during the Democratic Convention week. The first Warchest Tour began in the plaza of Bank of America world headquarters on the first day-- Monday-- of the Convention. Two hundred of us gathered and listened to one of the Warchest Tour collectives explain how the Democrats and B of A are involved with each other and B of A's investments in South Africa, Poland, etc. We then counted down "10-9-8-7-6-5-4-3-2-1!" and dropped to the ground screaming and writhing and then still. After a minute we got up crossed the street and gathered on the steps of Diamond Shamrock, producers of Agent Orange (used in the Vietnam War to defoliate Viet Nam and poison Vietnamese people and U.S. service people), the subject of a lawsuit by Agent Orange-sickened Vietnam Vets and major contributors to the Democrats. As the information about Diamond Shamrock was being read, a line of fifty helmeted, club-wielding riot cops marched up Kearny St. in front of us and before we realized it had surrounded the demonstration. The Police captain notified us with a bullhorn that we were under arrest for "felony conspiracy to commit a misdemeanor." With no way out, we sat down and chanted "democracy in action." A large crowd of financial district workers gathered. A group of people who had avoided being surrounded moved into the intersection of Kearny and California, counted down to ten, and died. They blocked a cable car and shut down traffic in the intersection. Moments later about a dozen large men in jeans, plaid shirts and baseball caps emerged from the crowd and began to grab those who had just died in, tackling and punching people who tried to get away. They were plainclothes cops who would continue to follow us through the week. It was clear from the felony charges, for which one can't as easily get out, that the local authorities wanted to keep us off the streets in jail during much of the week of the Convention. A movement lawyer, however, found a judge who signed an order releasing us on our "own recognizance." We were let out in the wee hours of Tuesday morning. Most of the corporate media coverage of the Warchest Tour arrest called it a punk protest and described some people's "punk" appearance, but did not utter a word about our purpose of challenging the Democrats. The second Warchest Tour was on Wednesday, July 18th. We decided to invite and speak to the media in the hope their presence would discourage the police from arresting us and in an effort to get our political point across, so we sent out a press release and made a statement before the Tour. The media showed up in force as did about 500 supporters, many who were upset about the arrest two days before. Most of the corporations we stopped at locked their doors when we neared. B of A world headquarters had a sign in its glass door saying "closed due to protest". On several occasions riot police tried to push us away from the corporations, but each time the media would rush to the front to film it, providing a safety buffer. No one was arrested that day. On Thursday July 19th, the last day of the convention, we held the final Warchest Tour. It started at a Rock Against Racism/Reagan concert on Mission St., near the Moscone Center protest Zone in the vacant lot that had once been low-income housing and later became Yerba Buena Center. The concert featured well-liked punk bands, including MDC (Millions of Dead Cops) and the Dead Kennedys. The Democratic Convention was held at Moscone Center and authorities set up a "free speech" area across a giant empty lot a stone's throw and a temporary tree-barrier away from the Convention. The tour left with four hundred people as the concert began. After tour stops at several corporations, we left the B of A world headquarters (closed for protest again) and headed up Kearny Street. A line of mounted police blocked the end of the sidewalk and street as another line of police blocked us from behind. More than half of the tour ran away through a parking lot or made it through police lines. The police continued to grab people in the area. A forty-year-old high school teacher was grabbed by four undercover police who twisted his arm back audibly breaking his elbow at two places. When he asked them to stop one cop called him a "sissy." A group of us who got away returned to the Concert, which had grown to about 2,000 people. The concert organizers let us on stage to tell people what had happened and we asked everyone there to join in marching on the Hall of Justice to demand the Warchest Tour arrestees' immediate release. When the concert concluded, the entire audience joined us, taking the streets and marching to the Hall of Justice. A satirical giant Trojan donkey (which ate mock tax dollars and shat out weapons) on wheels joined the march. The police had closed off the streets in the area, shut down the nearby highway off ramp, and followed our march with a helicopter overhead. When we arrived yelling "set them free," there was an army of helmeted police with clubs spread shoulder to shoulder along the top steps of the Hall of Justice and in the street in front of us. The police declared us an "unlawful assembly," as they still do in San Francisco when they don't feel in control, and ordered us to disperse. Several hundred of us in the front sat down to both hold our ground and to de-escalate the imminent threat of police violence/riot. A line of police came from behind us and began to seal off the block. Most of the marchers quickly got behind the police line, while about two hundred people sat-in in the street in front of the Hall of Justice. The police and sheriffs moved in numerous buses and began to walk and drag onto them those of us seated, taking Polaroid mug shots on the way. Meanwhile mounted police were chasing and dispersing those who had gotten away and a gang of plainclothes cops were tackling and arresting people. Joren, a sixteen-year-old punk in my affinity group, was intentionally trampled by a mounted cop and received a fractured skull as she lay in the street. Another man I met in jail had been grabbed by plainclothes cops and his shoulder was raw from being dragged and his face was bruised from being slapped across the face with a gun. Walter Mondale, as expected, was being nominated Democratic Party presidential candidate. The nearly three hundred arrested were held in a temporary detention facility at Potrero Middle School. 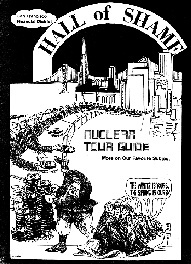 Map and Cover of the 1984 Hall of Shame Nuclear Tour Guide.